Dental Care Associates of Waycross | What is a Root Canal? Unfortunately, an infected tooth cannot heal itself. Extracting the tooth may stop the pain, however tooth replacement procedures - like dental bridges, implants and dentures – can be a more costly investment than saving the tooth. A root canal is usually the recommended procedure to save a tooth when there is enough remaining structure to support a fixed restoration. 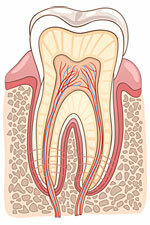 Teeth have an internal pulp chamber with a blood supply and nerve. When the nerve of a tooth becomes infected by dental disease, deep decay or trauma, pain and swelling can occur. During a root canal procedure, a small opening is made in the tooth so that the infected tissue and nerve can be carefully removed; then root pulp chamber is cleaned and sealed. Teeth that have had root canal therapy lose vitality, making the enamel more susceptible to cracks and breakage. The procedure is finalized with placement of a dental crown to protect it from further damage. Regular preventive dental cleanings and exams are the best defense against painful toothaches. If you have broken teeth or experience intermittent discomfort or sensitivity, don't wait until the pain becomes unbearable. Make a smart choice for your oral health and your budget. Schedule an appointment with Dental Care Associates of Waycross.